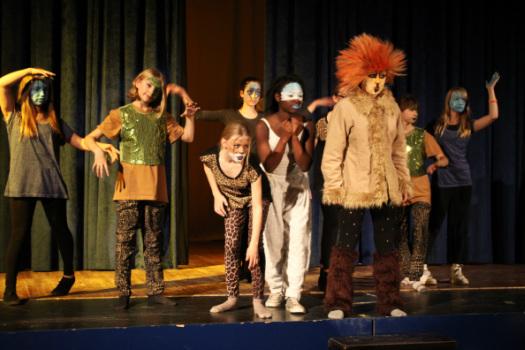 Wednesday, Thursday and Friday of the first week of December saw another successful school show performed in the Hall. This year the show was a little different as the style of the show was ‘immersive’, meaning that the play was performed amongst the seated audience and the actors interacted with them. At the start of the play an atmosphere of 1940s’ Britain was created with ‘Ration Card’ programmes and cast members dressed up as evacuees welcoming the audience in, leading them to whichever train they were being evacuated on or taking them on a tour of the professor’s house complete with incompetent maids. In the interval the location of the play then transported to Narnia with the cast dressed and made up as magical creatures, such as squirrels, mice, eagles, dryads and naiads. Another special aspect of the production was how much of the work behind the scenes was done by pupils: George Fuller and Lewis Watson (Year 10) designed, rigged and operated the lights, mostly independently of teachers. Peter Smith (Year 11) created all the sound effects and the music, this was very important because we needed animal noises and dance music. Conor Litten (Year 13) played live music during the interval, which suited the play and the 1940s’ theme; it was very nice of him to do this for us. Several volunteers from the Sixth Form did all the make-up for the Narnia creatures and animals and did an amazing job at it too; all of this work was done voluntarily, demonstrating the great commitment everyone had to the project. Hannah Stacey (Year 13) should have a particular mention for the amazing job she did as Stage Manager, organising cast members and noting all the acting and movement down. Without her there would not have been a show; she held everything together and was Ms Brazier’s right hand woman! The main characters were played by Georgina Leeson (Lucy), Shannon Taylor (Susan), Thando Parker (Peter), James Green (Edmund), Joseph Masters (Mr Tumnus), Fabienne Severin (White Witch) and Tara Burgess (Aslan), who were amazing and put a lot of effort in. For the cast this was a huge commitment - it was often difficult, but it all came together at the end, with an audience of over 350 people coming across the three nights.